Huobi Group launched the cryptocurrency exchange dedicated to EOS, called the Huobi EOS Exchange. It said the trial operation started in January. 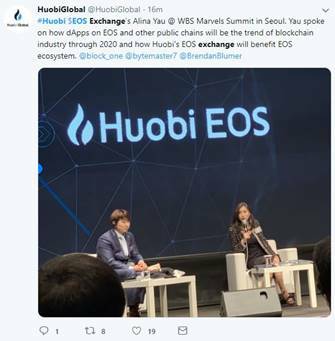 Huobi Chief Operating Officer Alina Yau outlined what the Huobi EOS Exchange is in the fourth World Blockchain Summit in Seoul Wednesday. Alina said the Huobi EOS Exchange is an upgraded version of the existing decentralized EOS exchanges. It provides an upgraded user experience, he added.